Lunch: Monday - Saturday: 11:00am - 5:00pm, Sunday: 12:00pm - 5:00pm. Dinner: Monday - Thursday: 5:00pm - 9:00pm, Friday - Saturday: 5:00pm - 10:00pm, Sunday: 5:00pm - 7:00pm. 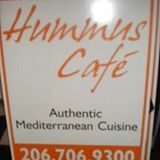 The Hummus Cafe offers authentic Egyptian-Mediterranean cuisine. "Eating here is like eating in the kitchen of a fussy Egyptian mom", (City Arts, Jonathan Zwickel). Try our homemade Hummus and falafel. Our traditional green soup is light, fresh & original. Don't leave without trying our homemade desserts, flaky baklava and our tender cakelike treat called basbousa—are sublime.